Will Windows 10 be good for gaming? I still use Windows 7, but I’m going to have to upgrade eventually, regardless of the terrible Modern UI-induced stress I get (what the crap is Xbox Music?). We’ll all have to upgrade eventually, because we’re going to want DirectX 12 features, right? So it’s great news for us that Microsoft will be offering free Windows 10 upgrades for a year. To clarify, Microsoft’s poorly-worded announcement made it sound to some like the free upgrade would eventually involve a subscription plan. What Microsoft meant was not “free upgrade for the first year,” but “upgrade for free within the first year.” It’s not a subscription: it’s a free, one-time upgrade from Windows 7 or 8 to Windows 10, which includes free future updates, the way Windows has always worked. 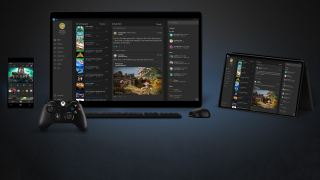 My hope is that mass adoption of Windows 10 will defragment the PC gaming audience—we'll never all be on the same hardware (and wouldn't want it that way), but at least non-Linux PC gamers can be on the same version of Windows and DirectX. Back when Windows Vista launched, everyone who chose not to upgrade missed out on DirectX 10. Vista didn't have a lot of fans, because it was absolute garbage. If Windows 10 suffers the same fate, DirectX 12 (and I’m 99% sure the full features of DX12 won't be available on Windows 7) will go underutilized. But why would that happen if Windows 10 is free? I reached out to a few developers to chat about the news, and Gaslamp Games CTO and lead programmer Nicholas Vining isn't as optimistic. Vining points out that only around 50% of Windows 7/8 users have DirectX 12-capable hardware (actually, it’s some number greater than 50%, according to Microsoft, but apparently not high enough to note the difference). And even if they do have capable hardware, he says, that doesn’t mean their hardware will perform well, and there’s no guarantee they’ll all upgrade to Windows 10 even if it’s free. Lots of people, myself included, are perfectly happy with Windows 7. After the year of free upgrades, Microsoft will be selling Windows 10, but Vining's skepticism is fair—we don’t know exactly what else Microsoft may be planning. But we see that free upgrade window as a push to wash away the sins of Windows 8 and get as many people as possible onto one OS. The sooner Microsoft moves past Windows 8, the sooner they can stop putting out significant updates for it, freeing them up to focus on forward progress. Shams Jorjani, VP of Acquisition, Portfolio Strategy & Unicorn Division at Paradox Interactive, didn't have any insight about unicorns, but did have a few things to say about DX 12. He seems somewhat indifferent to the advancement (and unsurprisingly fond of Paradox games). "DX12 mainly means more advances in graphics—which means another step up in the technological arms race some devs/publishers enjoy participating in—and that's fine as it leaves more room for us, the connoisseur's choice,” wrote Jorjani. “What makes a Paradox game beautiful isn't necessarily shaders, tessellation, SSS, or other wizardry—just good gameplay. Then again, we have a few games that do look pretty so it's a win-win for us." As for that “technological arms race,” we've yet to see exactly how DX12 will make games better in the wild, but the evidence so far looks good. DirectX 12 is intended to improve multi-threaded performance for games and let directors code 'closer to the metal,' with less overhead between their code and the CPU and GPU. Not all game developers need that level of control, however. "DirectX 12 is intended to improve multi-threaded performance for games and let directors code 'closer to the metal'"
Intel showed off an impressive demo back at SIGGRAPH 2014, and during today’s Windows 10 reveal event, Phil Spencer said that “for CPU-bound games, DirectX 12 will increase the performance of those games by up to 50 percent.” That’s great, but it may be that the upgrade primarily matters to those who engage in the arms race—the Activisions and EAs—while the rest stay focused on supporting Windows 7. With that perspective, it’s not really good news or bad news, just neutral news: upgrade for free to Windows 10 to get DX 12 features in whatever games utilize them, but don’t necessarily expect Windows 7 and DX 11 to be ditched. We may stay fragmented after all. Even though I hate the sight of Windows 8, I do plan to upgrade to 10 to see what it can do. I’m a little nervous, though. Microsoft pushed a few things today that made me uneasy, such as the ability to stream Xbox One games to a PC. There’s nothing intrinsically wrong with the feature, but I’m wary of any more attempts to treat the PC like an Xbox companion. Likewise, there’s nothing wrong with the functionality of the new DVR system, which will allow us to capture, edit, and share game footage, but I tend to back away from anything that seems to involve me more in the Microsoft ecosystem. Again, what the hell is Xbox Music? I want Windows to sit quietly and run my games, and I hope that Windows 10’s new features can be shushed. As long as it doesn't intrude too much, though, I’ll be happy to take the free upgrade offer—even if I still think it looks like an OS designed for babies. There are also some important upgrades in Windows 10 that Windows 7 might not know they're missing—better performance across the board, much faster boot times and far better UI scaling for 4K+ resolutions, for example. And then there’s the crazy augmented reality stuff, but I don’t know enough about that yet to know how much I care (we’ll have more on Windows Holographic soon). Knowing what we do know, do you plan to upgrade?